If you're an SEO, you should know and love content marketing. If you're a content marketer, you should know and love SEO. Search is one of the largest channels to drive traffic online, and without content it's hard to rank anything at all. Today I want to talk about the role of content and links in SEO. Specifically I'll show you how I use SEMrush for keyword research to identify the types of content and pages my clients need to create to win in search. I'll use a real example to show how we work to build links to clients' websites in order to help them win in search within their industry. I’m going to pick a topic I haven’t specifically researched myself for this example: beer brewing. I’ve brewed beer with my father a handful of times and I’ve greatly enjoyed the experience. I’m a firm believer that you should know the fundamental pieces of anything you enjoy in your life, and beer is on that list for me. I haven’t previously done any serious research into the [beer brewing] SERP or niche. Today, let’s change that. 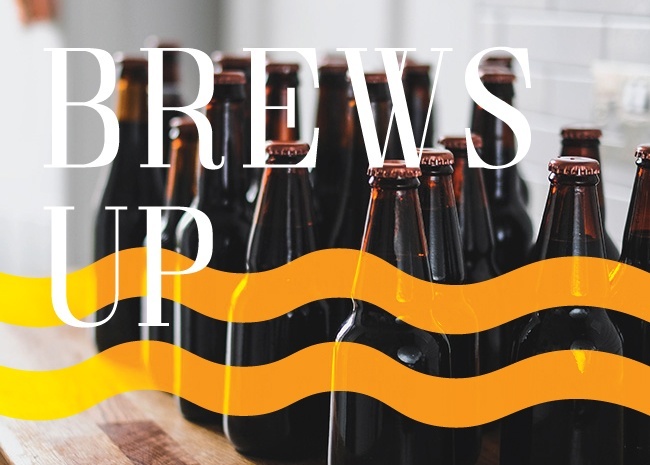 Our fictional client will be a beer brewing supplier, selling all the various ingredients, recipes, kits, and equipment you'd need in order to brew beer yourself. Let's talk about how I would approach that client as an SEO. We'll assume in this case our fictional beer brewing supply website has solid technical SEO and onpage optimization. At this point they're looking to expand their existing online presence, traffic, and sales. There are only a handful of options to improve an already decently optimized website: links to existing pages, or fresh content designed to capture new keywords. There are a handful of tactics we consistently use at Page One Power to build links back to client websites in order to amplify rankings and traffic. Most of those link tactics directly involve content. For links to have evergreen, lasting value and impact for clients, they need to be editorial in nature. 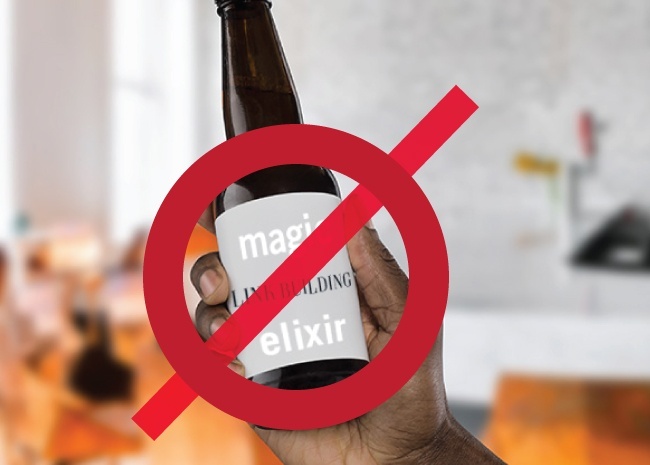 We can't force anyone to link to our clients, and as much as we might occasionally wish it, we don't have a magical link building elixir. Pretty much all of our links are built based upon the value of the link to the linking site's audience. It has to be in the interest of the website to link to our client's page, based upon the inherent value of the page. There are reasons aside from really valuable, compelling content that another website would link. But those opportunities are rare, and hard to control. You'll need a client that has created a compelling brand, has established authority, has defined market fit and value, or some level of press coverage. Most likely some combination of all the above. Those are traits that can only be created through a long life as a good, visible business. Plenty of our clients are either new, work in obscure markets, are still working to establish authority, or maybe even still working to establish market fit. Is relevant to our client's product, service, or business. Has defined value for a relevant audience. Is capable of securing links from worthwhile websites. No single piece of content perfectly encapsulates all four elements, but there should always be some blend across each piece of content. 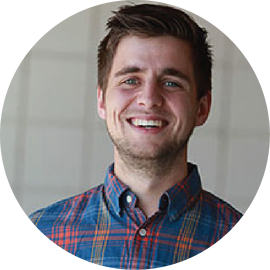 Our job is to identify the intersect between pages we can build links to, pages where links will have an impact, and client goals. And once we identify those pages, to promote the hell out of those pages to the right audience in order to secure links. Most clients come to us with a short list of head terms they care most about. They define explicitly the way they make revenue as a business. And they want to rank higher for those terms. This is one way to win in search, but it's very narrow. It misses the largest piece of the search pie, which is informational searches. Navigational: the searcher types in the name of the website, brand, or product with the express purpose of navigating directly to a known site or page. Informational: the searcher uses keywords designed to describe something they want to learn more about. Commercial: the searcher enters a product, service, or commodity they're interested in purchasing to see what's available, at what prices, etc. Transactional: the searcher enters an exact product, service, or good with the direct intent to make a purchase. Navigational search is very hard to capture, as you effectively have to rank for a brand or product that someone else is intending to search for. 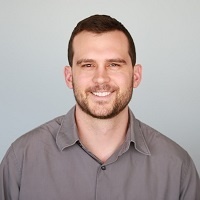 Commercial search is typically what our clients care most about, as it directly influences their revenue and has the shortest path to conversion (aside from transactional). Informational search terms are the ones we have the most influence over and represent the majority of searches online. Our first foray into helping the client improve their organic presence is understanding their competitive landscape within search. We need to identify the important keywords that influence their niche. I'm a firm believer in the simplest route forward, so in this case we'll simply pop open SEMrush and enter in the client's most obvious head term, [beer brewing]. There's a nice mix here. [beer brewing kit] has commercial intent, and is directly relevant to our client. Making sure they optimized for the word [kit] would be high on my radar, as well as the traditional mix of [equipment], [supplies], etc. There's a wide mix of informational terms high in search volume, including [how to brew beer], [beer brewing process], [how to brew your own beer]. Right off the bat I'm thinking a guide on how to brew beer at home is going to be an extremely important page on our theoretical client's website. If they have the page I'd review it to see how it's doing in terms of rankings and links. If they don't, it will be high on my list of recommendations. Let's dig a bit deeper though before we come to any final conclusions. I used the head term that best described my client's commercial service: [beer brewing]. But that's a modification of another, larger head term. 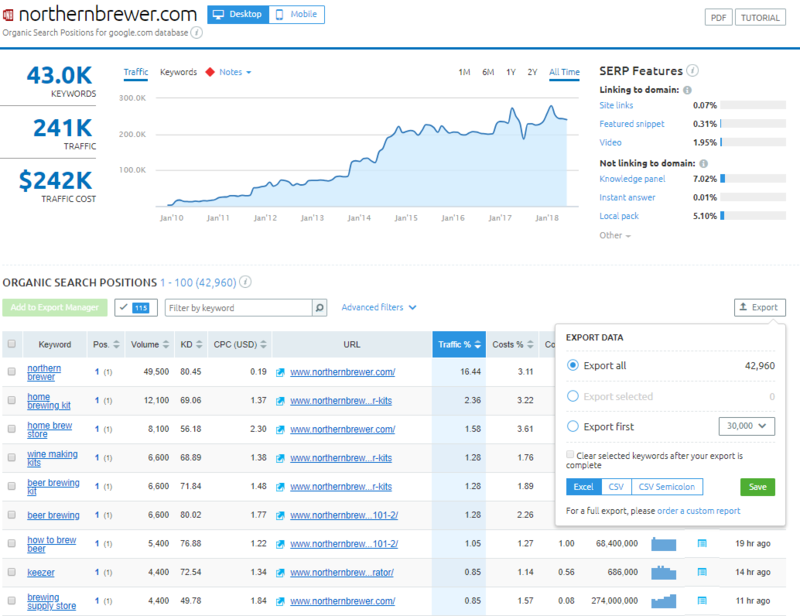 It's worth looking at the head term [beer] within SEMrush to look for missed opportunities. There is definitely less relevance overall here. However, there is one term that jumps out at me: [types of beer] at 18,100 MSV (monthly search volume)—more than double our head term, [beer brewing] at 6,600 MSV. 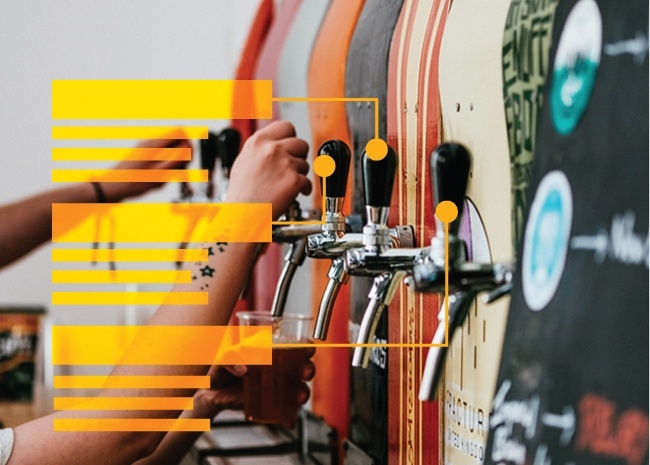 [types of beer] is 100% informational intent, and it's directly relevant to a beer brewing supplier, who would provide the opportunity to craft multiple types of beer. This could be a solid opportunity for our client to target a high-volume keyword with relevant, authoritative content. 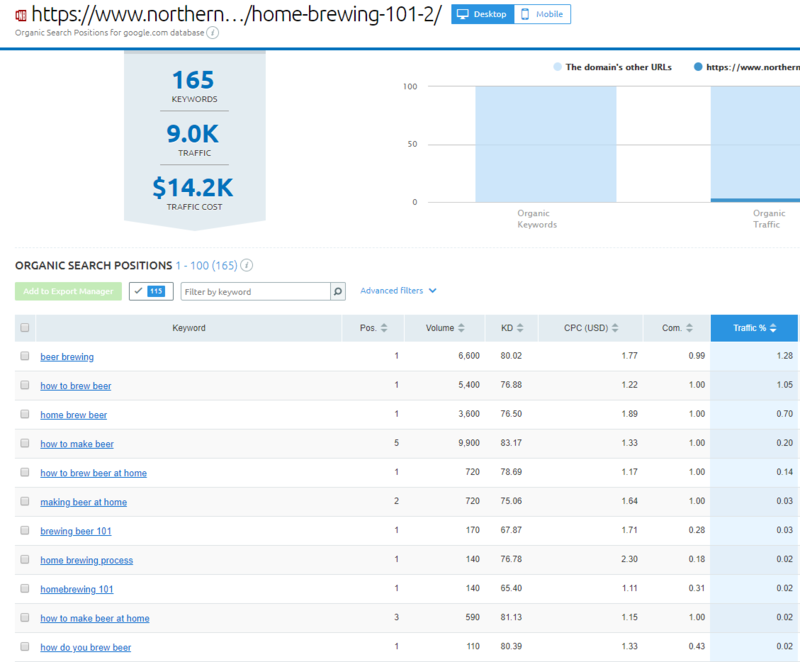 At this point I have a decent idea of the terms driving the most search volume in the beer brewing space. But reviewing keywords without reviewing the actual SERP is always a mistake. So let's pop into the actual search results to review the types of pages, websites, and companies ranking for the term we may want to target. Review the SERP to identify features, intent, and types of pages and sites ranking. Identify competitors consistently ranking well within the SERP. Review the quality, depth, and links point to the ranking pages and determine rank opportunity. In short order I want to know what types of pages are ranking, what types of sites are creating those pages, and whether or not this is a SERP I have a feasible chance of winning with new content. I also want to identify very successful competitors and review their sites to learn which pages drive the most traffic to their site. Our client's head term, [beer brewing], actually has as much informational pages as commercial. In fact, the #1 ranking page is actually a guide to brew beer at home, not a commercial or product page. 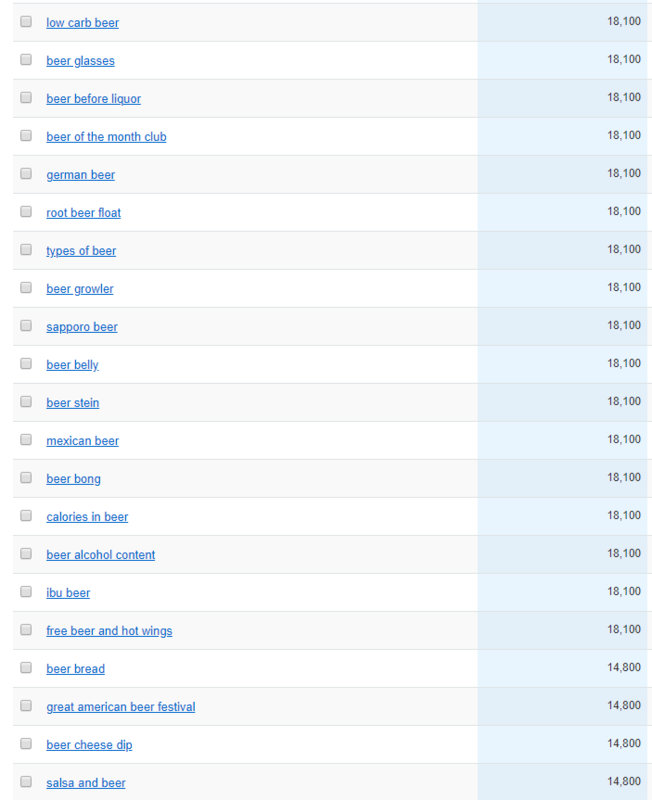 There are only a few commercial pages (equipment) within the [beer brewing] SERP. Trying to rank a client's product or category page appears to be an uphill battle. There is a fair amount of locality within the [beer brewing] SERP. [types of beer] has much larger, authoritative domains ranking within it. This type of SERP would be a long term target, certainly not low hanging fruit. [beer brewing process] tends to be list-oriented, short synopsis of the actual steps involved, as opposed to in-depth guides on how to brew beer. Images are largely prevalent, with a few videos. [beer brewing recipes] is much what you'd expect: category pages listing different beer brewing recipes. Interestingly, a few beer brewing suppliers use this opportunity to link to actual kits, as opposed to informational pages. Overall these SERPs have a fair bit of domain variety. It's not always the same handful of sites cropping up again and again: the space appears to be fairly competitive, with many sites offering rich, informational content. If our client wants to be competitive they'll need to create truly informational pages that do the best job of providing the information people are searching. 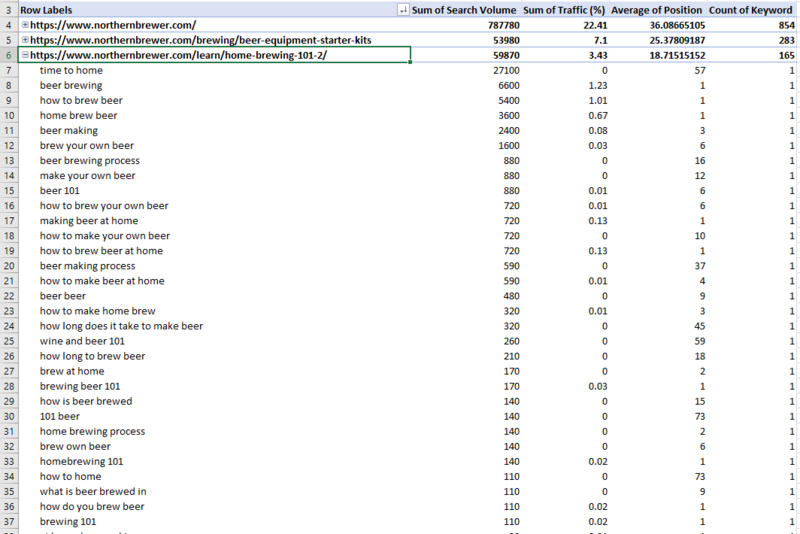 Let's dig in a bit deeper and see the actual keywords and traffic some of these pages are responsible for. We did a quick analysis of the SERPs, looking at ranking pages, domains, searcher intent, and overall quality. Now let's use SEMrush to review the actual keywords and traffic these pages drive. 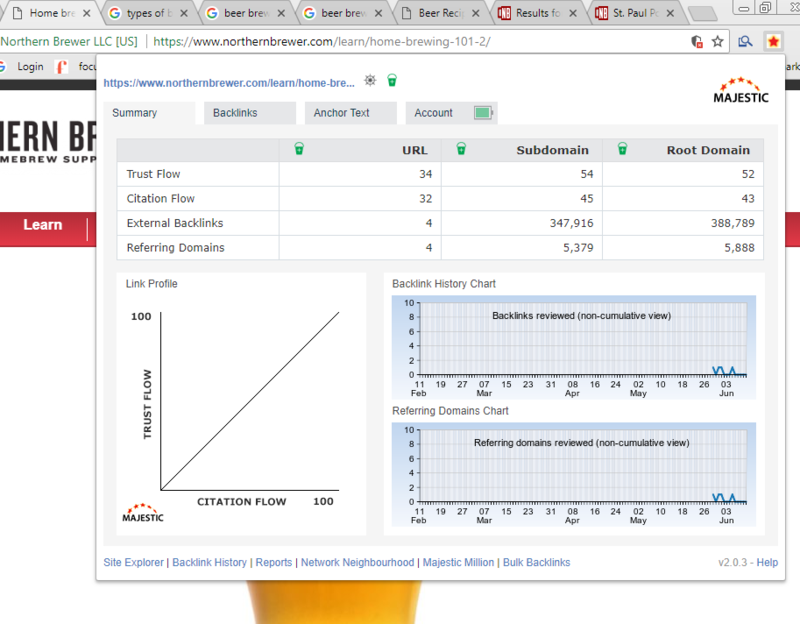 First, let's look at https://www.northernbrewer.com/learn/home-brewing-101-2/ since it ranks #1 for our head term, [beer brewing]. 165 keywords, an estimated 9,000 organic visits per month. If you were to pay for all of their keyword rankings it would cost an estimated $14,000 per month. There's no doubt this is an important page on Northern Brewer's website. Given the addition of the "2" at the end of the URL it's possible we're missing an older, more linked to version of the page that now redirects. However, nothing obvious is returning a hidden link trove, and looking at the entire domain by top linked pages also doesn't return a different, better-linked version of the page. 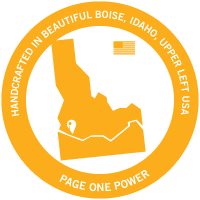 Let's take a quick peek at Northern Brewer as an entire website and see where this Home Brewing 101 page ranks. Flip over to the "Pages" tab in SEMrush under Organic Research. 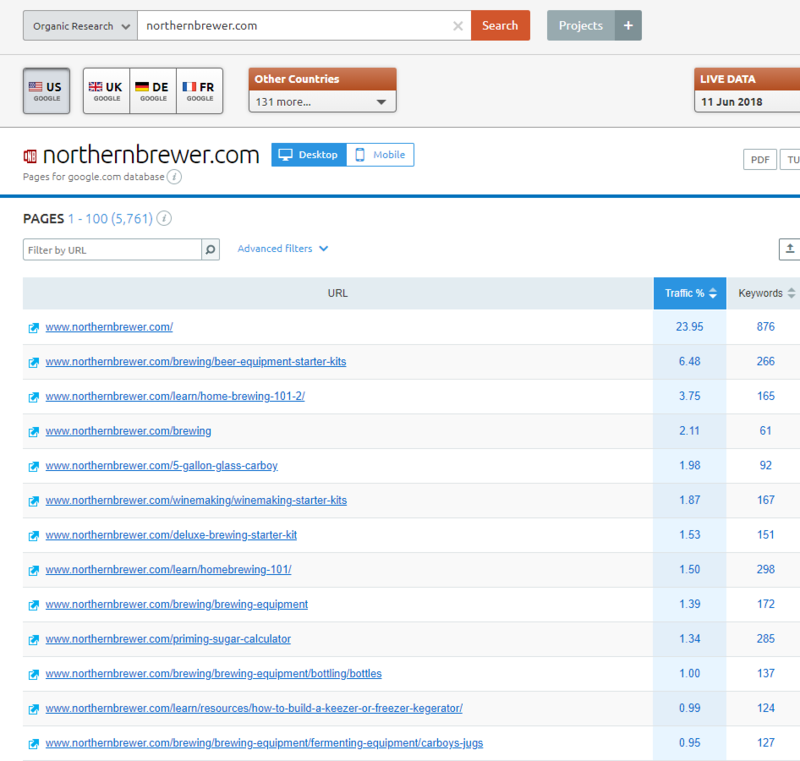 As you can see, the Home Brewing 101 page is their 3rd most visited (organic traffic) page on the site. We can also see that an older version of the page (which now redirects) ranks at the #8 spot. Clearly an extremely important page for their website. While we're here, let's glance through their other pages to identify other content and keyword opportunities. How to build a keezer. Super interesting to see what content they've created to drive organic traffic and important keyword rankings for their website. Let's not stop here though — let's start reviewing competitors en masse and export all of their data out through SEMrush's handy export filter. Let's export a couple and review in Excel. First, flip back over to Organic Research --> Positions. Then, click the Export button at the top right of the table and choose Excel. This will download a full Excel file with all keywords. Let's pop open the data and start analyzing the information. 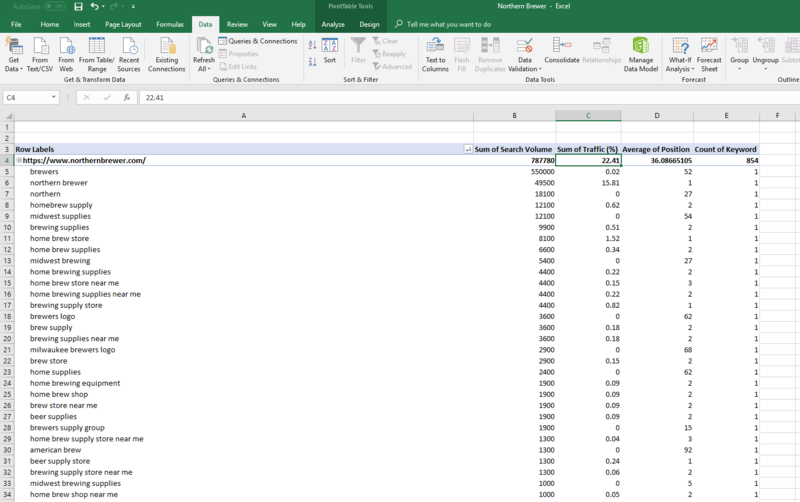 There's a handful of ways to analyze the data once you have it in Excel, but my favorite way to cut right to the point is to simply pivot the data by URL and keywords. Here's the step-by-step on how to create that pivot table. 1. 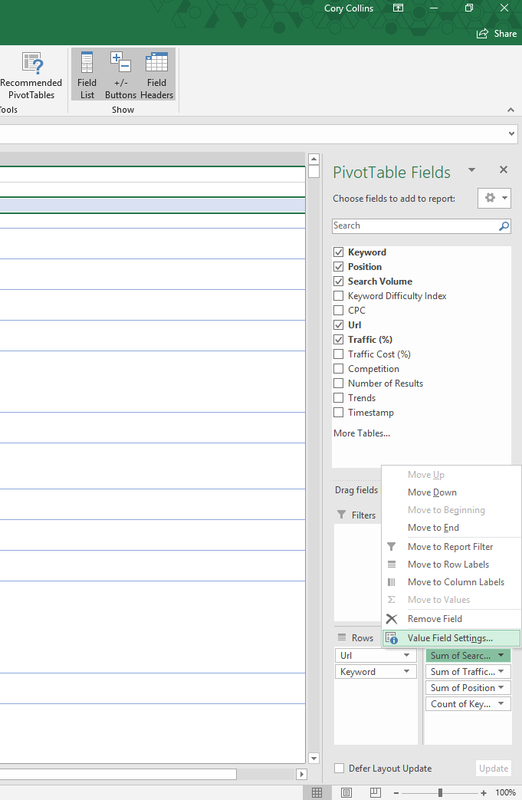 Click into the Insert menu and choose "Pivot Table"
2. This will pop open the menu as you see above. 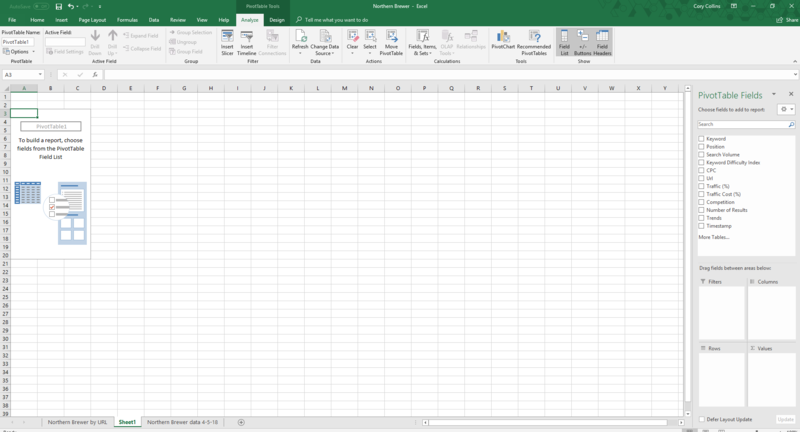 Click "OK" and Excel will create a new, blank sheet with a blank pivot table. 3. 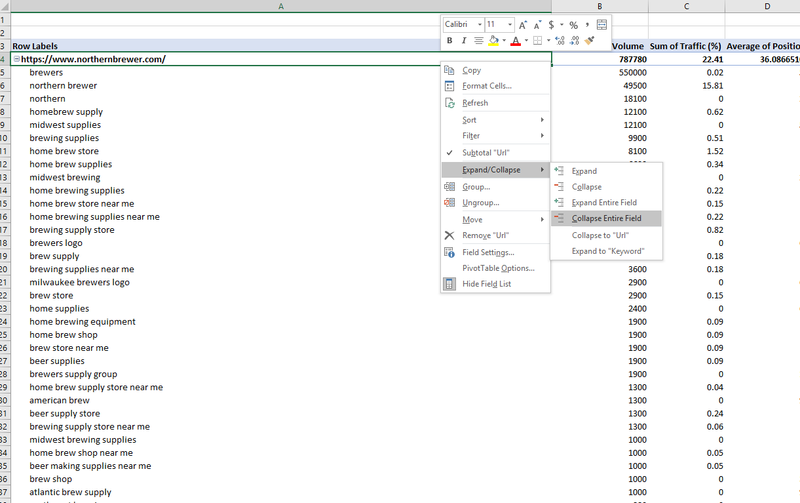 You're ready to create your pivot table based on how you want the data displayed. You manipulate the data with the far right menu, "PivotTable Fields". Move URL to the Rows field list and then group Keywords underneath URL. This will group all keywords by the URL they're attributed to. 4. 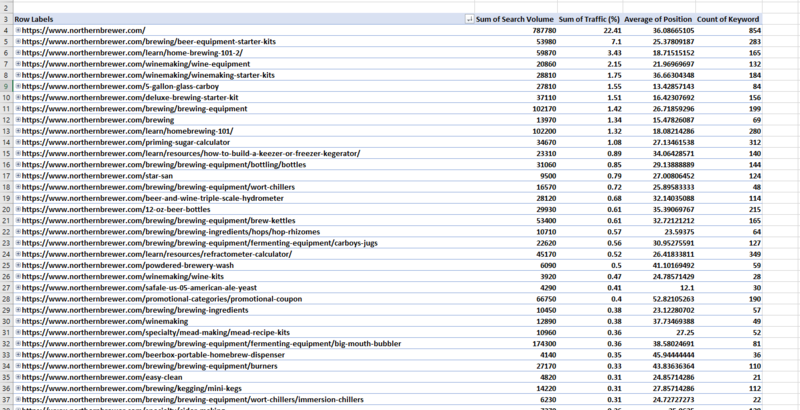 Next, in "Values" add "Search Volume", "Traffic (%)", "Position", and "Keyword". 5. 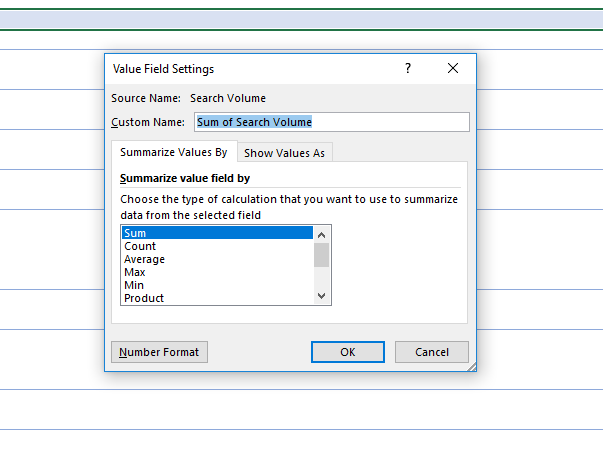 Change "Search Volume" value field settings to sum, "Traffic (%)" to sum, "Position" to average, and keep "Keyword" at count. 6. 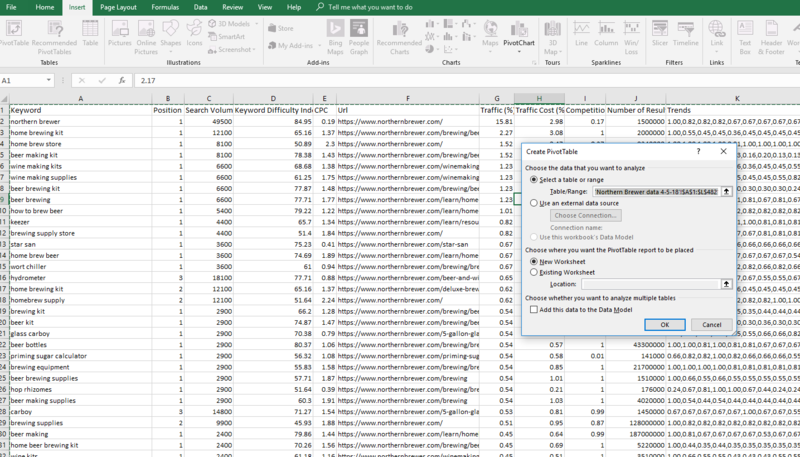 Sort the pivot table by Traffic (%) at the URL level, and Search Volume at the keyword level. Simply click into the field and under the Data menu choose "Z-->A". 7. Right click on one of your URLs and select "Expand/Collapse" --> "Collapse Entire Field". Now you have the full list of pages SEMrush has found for the site in question (Northern Brewer, in this example), ordered by the % of organic traffic that page is responsible for to the site, based on SEMrush's estimates. This is serious data to help us make better, more informed decisions. Even better, if you double-click any of those URLs you'll expand the URL to see all keywords that page ranks for, according to SEMrush. You can review the keywords SEMrush has found that page to be ranking for, how often that keyword is searched every month (search volume), and where that page ranks (position). 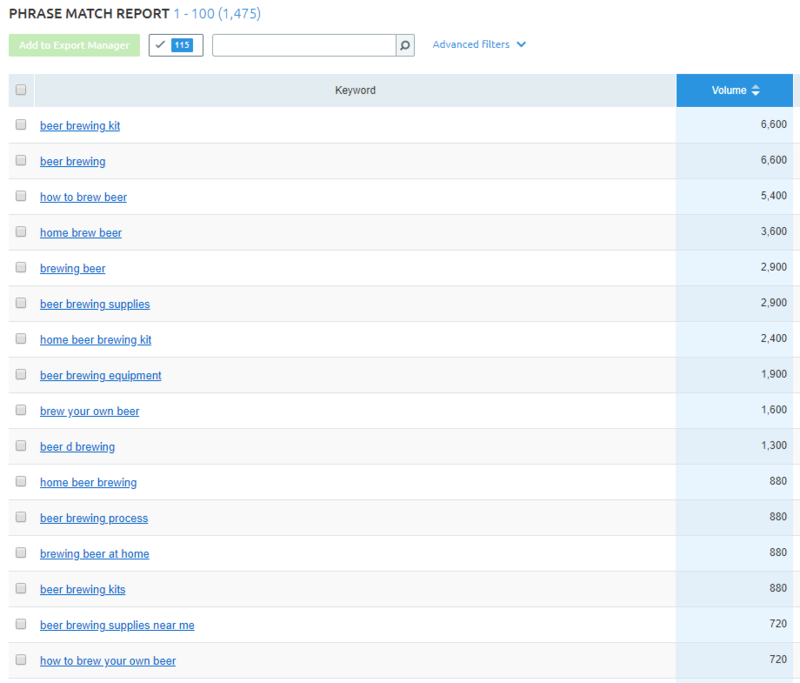 You can even see how much traffic SEMrush believes that keyword is responsible for (Traffic %). This is exactly the type of data you need to win in search, create the most optimized content possible, and deliver a compelling narrative to management and decision makers about the opportunity available. I recommend analyzing at least 3-5 competitors. Ideally you'll want a mix of direct competitors AND general search competitors (people ranking for shared terms even if they do not sell the same products or services as you). For our example, our direct competitors would have been Northern Brewer and Midwest Supplies. Our search competitors would have been howtobrew.com, craftbeer.com, and Beer and Brewing Magazine. Using the pivot table method above you can identify the best, most relevant opportunities for your site. Does the page align with business goals (will it bring in relevant traffic)? How much search opportunity exists for the page? How linkable is the page? What resources will it take to create the best version of the page (need to be at least as good as the competition if not better to rank)? How many links will we need to rank for our target keywords? Based on the factors above you should create the best pages possible to help your site win in search and grow relevant search traffic. And don't forget to review your own website as well. Ideally you should start by optimizing your own site and existing pages, as creating new pages always takes more time and resources. Because without all of the data SEMrush provides, none of this would be possible. Thanks SEMrush!